Apple’s next media event is now official. The company has issued media invites to an event scheduled to take place on Thursday, October 16, at the Town Hall auditorium on Apple’s campus in Cupertino, California, which is the same venue that was used to debut last year’s iPhone 5s and 5c. The tagline on the invitation reads, “It’s been way too long” which doesn’t immediately give any hints as to what we might see. Most expect to see Apple unveil updates to its iPad and iPad mini line as well as new Macs. Furthermore, Tim Cook and company will likely launch the public release of OS X Yosemite. Specifically, we’re likely to see an iPad Air that is thinner than the current generation with an A8 chip inside and support for Touch ID. The same can probably be said about the next generation iPad mini and if rumors prove accurate, at least one of the new iPads may see a new gold color option. As for the rumored 12.9-inch iPad that would compete with Microsoft’s Surface Pro 3, there’s no indication that it’ll show but you never know. The general consensus for Macs is that we may see the first Retina display on a desktop in the form of a new iMac. Given the smaller venue, the event is likely to be a more exclusive affair than the massive unveiling that delivered the iPhone 6, iPhone 6 Plus and Apple Watch last month. 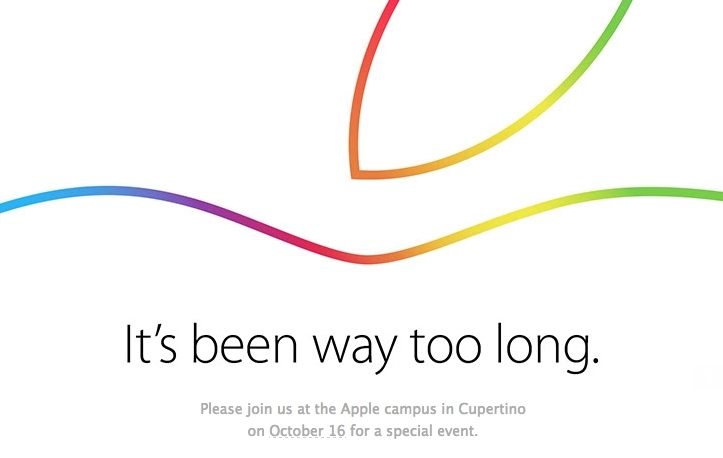 The 2013 event wasn’t live streamed over the Internet; no word yet if Apple will have a live stream this year.